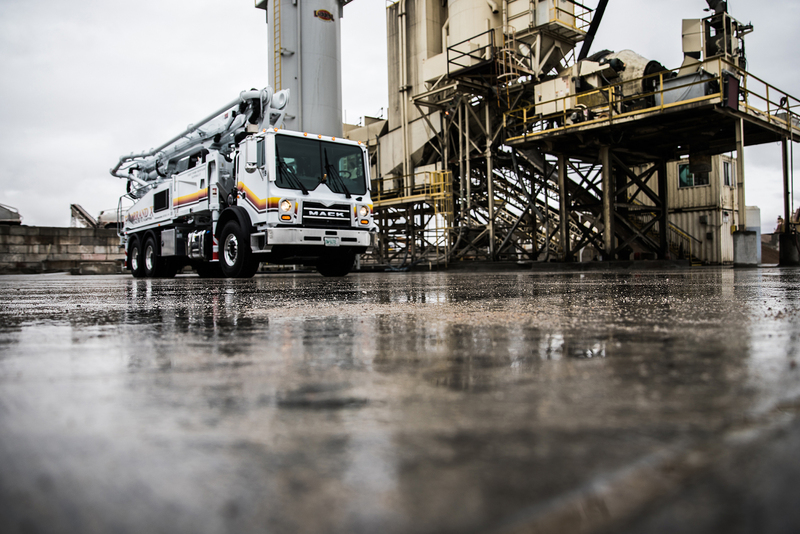 LAS VEGAS – Mack Trucks will offer the Mack® mDRIVE™ HD automated manual transmission (AMT) in Mack TerraPro® concrete pumper models beginning in 2019, marking the first time in the industry that an AMT has been available in a cabover concrete pumper. The fully integrated 13- and 14-speed mDRIVE HD AMTs give concrete pumper customers improved performance, proven durability and maximized uptime in an easy-to-operate package. Mack made the announcement at World of Concrete 2019 in Las Vegas. All Mack mDRIVE HD AMTs come standard with split-shaft PTO functionality. Instead of taking power from a transmission- or engine-mounted PTO, split-shaft PTOs receive output directly from the transmission, supplying higher torque for large auxiliary equipment including concrete pumps. The Mack mDRIVE HD is fully integrated with Mack’s legendary engines and axles, providing additional performance and efficiency benefits for customers. In TerraPro concrete pumpers, the mDRIVE HD will be paired exclusively with the 11-liter Mack MP®7 engine, and will be available with higher horsepower and torque ratings than equivalent models with conventional automatic transmissions. That includes the MP7’s top rating of 425 horsepower and 1,560 lb.-ft. of torque, which packs 13-liter power in an 11-liter engine. The mDRIVE HD for TerraPro concrete pumper models is available as a 13-speed direct drive or overdrive, as well as a 14-speed direct drive. Like all Mack mDRIVE AMTs, the mDRIVE HD in TerraPro concrete pumper customers will be monitored by Mack’s GuardDog® Connect telematics solution. GuardDog Connect, which comes standard on all Mack models powered by Mack engines, provides proactive monitoring and repair planning, real-time diagnosis of issues, repair scheduling and confirmation that needed parts are in stock and ready to install. Together with Mack ASIST and Mack’s OneCall™ uptime experts, GuardDog Connect delivers decision-critical information to maximize customer uptime. The mDRIVE HD offers customers simplified maintenance compared to conventional automatic transmissions, with service intervals of up to 500,000 miles. If the mDRIVE HD does require service, customers can simply visit any authorized Mack dealer, eliminating the additional time and hassle of visiting a third party service location. Mack’s mDRIVE HD is based on the proven design of the mDRIVE, which has been standard in Mack highway models since 2014. With ruggedized internal components, including stronger gears and synchros, the mDRIVE HD is built to withstand the frequent shifting often found in construction applications. The 13- and 14-speed variants also feature low-ratio creeper gears, enabling the mDRIVE HD improved startability and ultra-low speed maneuverability. All mDRIVE HD AMTs feature a transmission-mounted oil cooler to help maintain optimal operating temperatures, even in the face of repeated, heat-generating shifts commonly found at jobsites. The mDRIVE HD also includes advanced standard features like Rock Free, which allows drivers to free stuck vehicles by rocking the truck back and forth simply by pumping the accelerator, and Auto Neutral, which improves jobsite safety by automatically putting the mDRIVE into neutral when the parking brake is set. Additional features like Grade Gripper, which helps prevent rolling backward on an incline, are also included, as well as MaxBrake, Performance Mode and more. The Mack mDRIVE HD in Mack TerraPro concrete pumper models will be available for order in February 2019. For more information, visit Mack Trucks at World of Concrete 2019 in booth C5103.